At the suggestion of Phil McGrew I led an informal group to catch the moon popping up behind the San Francisco Bay Bridge and the Coit Tower. It was lovely fun, though exhausting since I started my day at 3:00 AM to catch the moon setting. 12 hours later we caught it rising on the other side of the planet. This photo is a composite of two photos. Look carefully and you can spot where the moon was rising in the first photo. For details about the shot, see it here. Despite it being a composite, there is no skullduggery here. The moon really was that size and in that position exactly. I'll be writing a short entry on my BLOG explaining it all. 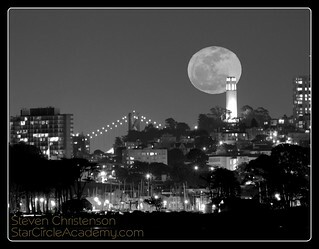 If you're wondering "do you have a photo of the moon exactly on top of the Coit Tower?" why yes, I do. I just liked this one a little better. In fact I was really delighted that the moon passed exactly where I expected. Didn't move my tripod at all. I also have a photo of the moon centered behind the Pigeon Point Lighthouse, but I prefer the one I posted. In retrospect, I'd have liked the Pigeon Point shot a bit better with the moon on the other side from where it is, but had I moved my tripod I couldn't have gotten the Impact shot.